Darling of the critics, Pinchas Zukerman has been hailed by the Ottawa Citizen as having " brought energy and excitement to the National Arts Centre. It's no surprise that fans and musicians are cheering the fact he has signed on for at least another four years." (February 12, 2002) Variously acclaimed as " a musician of genius" (Yediot Acharonot of Tel Aviv), " a veritable musical phenomenon" (Al Arab Ay Yawm, Amman, Jordan), " a great magician" (Neue WestfSlische of Bielefeld, Germany), there's no doubt that the flamboyant violinist and conductor stands out in this age of conformity and catering to the lowest common denominator. Zukerman plays his instrument with bewildering ease. As a conductor, his enthusiasm brings out the musical passion of his orchestra members, while he charms audience with his personal charisma and keeps the press on its toes. His high-voltage teaching style demands of his students both technical precision and shimmering sound. And yet this multitalented, consummate professional hasn't let it go to his head. La Scena Musicale talked with him in his office at Ottawa's National Arts Centre, slipping in between an administrative meeting and a rehearsal. 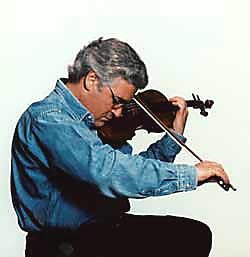 Zukerman was born in Tel Aviv in 1948, the same year as the creation of the state of Israel. He began studying music with his father, a self-taught Klezmer musician, starting with the recorder, then the clarinet. He was soon playing the violin with teacher Ilona Feher. A few years later the young prodigy was heard by the two most famous musicians of the time, Isaac Stern and Pablo Casals, who helped make it possible for him to attend the renowned Juilliard School in New York. Young Zukerman landed in New York in 1962, taking the Big Apple in his stride. He studied under Ivan Galamian, a hard taskmaster. But "Pinky," as his friends called him, undaunted by his teacher's technical demands and less than warm personality, progressed rapidly, and by 1967 had won first prize in the 25th Leventritt Competition. "Practise, practise, practise!" says Zukerman by way of explaining the secret of his success. "They've yet to invent a pill. Even if technology evolves, a musician must work every day. I practiced a half hour this morning before coming to the office because I don't like playing out of tune. Would you like to listen to someone playing out of tune? Of course not! Mediocrity is a disease. It's not dangerous if just one person is infected, but the virus spreads. Be very wary of it!" The maestro's sensitivity and ability to focus intensely complement his technical brilliance. When asked was he nervous before playing by the students of the Lycée Jules Verne in Paris and the Lycée Paul Claudel in Ottawa, his reply was, "Adrenaline flows and you feel in control, but you are always apprehensive because whenever you go on the stage you are vulnerable. The minute vulnerability leaves, I'll close the (violin) case. That's it"
Zukerman's gift as a chamber player on both violin and viola have endured over the years. He plays regularly with Daniel Barenboï m, Vladimir Ashkenazy, Itzhak Perlman, with the Tokyo and Orion String Quartets, Yefim Bronfman, Lynn Harrell, and his favourite partner, pianist Marc Neikrug, with whom he has done a number of recordings on both violin and viola. Some of these musicians have become friends and appear regularly as guest soloists with the National Arts Centre Orchestra (see box insert for details on the forthcoming season). While other violinists were labouring mightily to overcome their technical faults, Pinchas Zukerman took time to try his hand at conducting. From 1979 to 1981 he was music director of Britain's South Bank Festival. In 1980 he agreed to become music director of the St. Paul Chamber Orchestra. During his seven years in this capacity he succeeded in bringing new lustre to the orchestra through tours and recordings, got it onto a sound financial footing thanks to his managerial skills, and was the driving force in having a new 2000-seat hall built, an acoustical triumph that became the orchestra's new home. Prestigious invitations were not lacking: principal guest conductor of the Dallas Symphony orchestra from 1993 to 1995, artistic director of the Baltimore Symphony's MusicFest from 1996 to 1999. He is still artist-in-residence at the Milwaukee Symphony Orchestra, conducting and appearing as soloist for two weeks each year. In spring 1998 Zukerman took on the job of music director of the National Arts Centre Orchestra in Ottawa. His magic wand has transformed the organization on every level. He has organized a summer program for young musicians and conductors, which, incidentally, led to the discovery of Quebec conductor Jean-Philippe Tremblay, the dreamer behind the Orchestre de la Francophonie canadienne and now the maestro's assistant conductor. Zukerman took the NAC orchestra on tours to western Canada in 1999 and the Middle East in 2000 (a tour of Canada's Atlantic Provinces is in the works for the 2002-2003 season). He also initiated a project to distribute teaching materials free to Canadian elementary schools. Since Zukerman's arrival on the NAC podium, subscriptions have never been so sought-after. Donations have flowed in and the orchestra's deficit has been wiped out - all the result of his winning personality, which has captivated fans and hardbitten skeptics alike in the Canadian capital. Peter Herrndorf, director general and CEO of the National Arts Centre, said at the launch of the next season that Pinchas Zukerman's arrival as head of the orchestra had marked the beginning of a new and exciting era. The maestro has galvanized the troops both onstage and off, and is totally committed to excellence. Critics are sometimes astounded by his conducting style, but the 42 musicians seem to love it. During rehearsals he prefers to concentrate on the difficult parts, trusting his musicians to master the less arduous ones, with an occasional outburst to spur them on. "Conducting an orchestra requires a great deal of preparation," he nevertheless admits. "You have to mark the musicians' scores and know how to show them what they need. It doesn't seem right to say, as a conductor, that you're only here to beat time and the musicians will know what to do when the concert begins. Music should be a nine-to-five job, but when the curtain rises, it should be pure music." One has to see Zukerman lunging with his baton, absorbing the music through every pore, to understand that he has become one with the sound of the orchestra. It's hard not to notice how the musicians smile as they give their all for a conductor who is so spontaneous. The enthusiastic audience love him so much they don't hesitate to send thank you notes the day after the concert. "It's priceless," says the maestro. The Canadian press has often taken Zukerman to task for his lack of enthusiasm for Canadian contemporary music. He defends his position with vigour. "Contemporary music can be good or bad, like all other kinds of music," he says. "The same was true in Mozart's and Beethoven's day. Do we remember the names of all their contemporaries? Of course not! But I'm certain that in 200 years we'll still be performing Mozart, maybe on Mars, but we'll still be performing him." He says he looks for works with a natural musical idiom, and with substance. "You learn to recognize them with experience. Reading bad works is no more gratifying than opening your mail." This month the orchestra will announce plans for developing a contemporary music project that will include performing and commissioning Canadian works and providing professional training for young Canadian composers. To really understand Zukerman, you need to appreciate his total devotion to teaching. "I've always wanted to teach. In fact, conducting is not far removed from teaching," he says. It's another form of listening, he adds, this being a free translation of the motto given him in his youth by his teacher, "Mr. G" (Galamian), who said, "If it sounds good, you feel good, and if you feel good, it sounds good." And yet Zukerman considers the most important aspect of his own teaching to be the transmission of the system of musical values. "A half note is a half note and nothing else, and a B flat will always be a B flat. How you play it is something else entirely!" For some years now Zukerman has taught at the Manhattan School of Music, and has been among the first to use the latest developments, especially videoconferencing, as teaching tools when travelling. Thanks to broadband technology he can keep track of a student's progress in New York while he himself is in Germany, for example. Some of his master classes are also accessible on the web at no charge, enabling young violinists in every country to learn from one of the greats. "I saw the potential for teaching in this technology from the start," he says, although he seems reticent to use email. He dreams of installing a virtual studio at the National Arts Centre within the next five years in order to provide more direct interaction between teachers and students. One of the first things Zukerman did on agreeing to take up his post at the centre was to set up a program for young musicians. Last year, for the first time, the program welcomed young conductors. He is considering a unique program for young singers that would include regular singing lessons, diction lessons, theatre courses, and the presentation of an opera in concert. When asked to choose between performance and conducting or teaching, Zukerman says he doesn't think he can. "All three are essential," he says. The most important thing is to give music to the greatest number. "Music feeds me," he explains. "I'm never tired when I listen to it. I just hear it and I have to react to it immediately." Clearly, nothing will stop this musical juggernaut. Enter to win one of two prizes of three CDs of Pinchas Zukerman and the NAC Orchestra on CBC Records. Courtesy of the National Arts Centre. Contest closes April 15, 2002.